Once we get a core on deck, the science begins! This post will provide you with information about one aspect of that- analyzing (some of) the physical properties of the core. Let’s dig in! 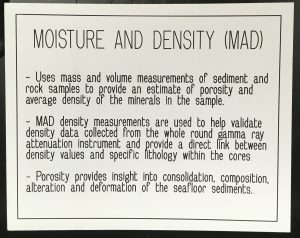 Physical properties analysis includes measurements of things like moisture, density, and porosity in the core sample. First, we must cut the core into a smaller piece for the tests. Remember, the core was previously cut in half horizontally, leaving one half as the “archive” half (it will be sent to a core repository) and the other as the “working” half. The working half is the one that is being used here, and the tests conducted on the working half are often considered “destructive”, since, well, you have to cut the core into smaller pieces to run the tests. 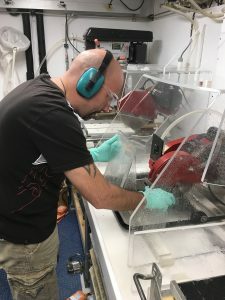 Paleomagnetist Fabio Caratori Tontini uses the diamond saw to cut cubes out of the hard-rock core. Once we have the core cut down to size, it’s time to begin the MAD science. The first step is to saturate the rocks with seawater. The rocks naturally have pore spaces inside, so we remove the air from the pore spaces and replace it with seawater, enabling us to measure the saturated weight of the sample. In the video below, the gas is bubbling out of the pore spaces in the core samples. After getting the saturated weight, the next step is to remove all the water from the sample. To do this, the cube is placed into an oven for 24 hours, then it spends a few more hours in a desiccator to cool off before it’s weighed again (this is the dry weight). The next part of the MAD science process is determining the density of the sample. Perhaps you’ve been taught the formula for calculating density. Does density = mass / volume ring a bell for anyone? Here on the JR, we have a machine called a pycnometer that gives us a precise measurement of the volume of the sample, and then using the previously recorded mass, calculates the density of the sample. 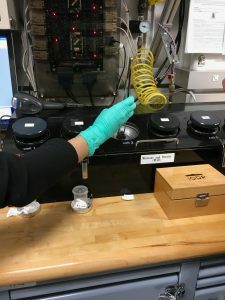 The pycnometer works by loading each sample into a chamber, and fills the chamber with pressurized helium to give us a super precise volume measurement, as opposed to the “old school” way many of us were taught (L x W x H)! Physical Properties scientist Aida Farough places a core sample into the pycnometer. So, have you figured out what MAD science is yet? Take a look at the photo below if you’re still not sure! **A huge THANK YOU to Aida Farough working in the Physical Properties Lab for walking me through the details!